Most garden hand tools are £5, for example, garden shears, secateurs, loppers, etc. 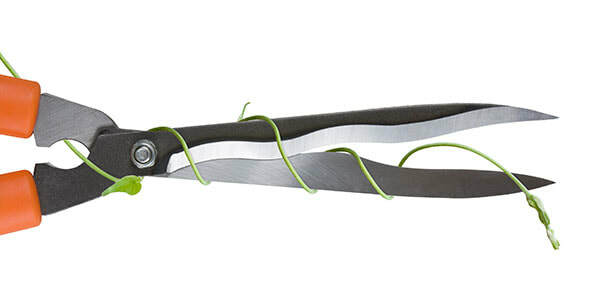 The more involved toothed blades such as chainsaws and hedge trimmer blades are £10 per set. Where appropriate, the tool is disassembled and given a brush over to remove excess rust, mud, grease, etc and then lightly oiled to help protect them. The blades are sharpened and given a shiny new edge, then a drop or two of oil in the pivot area and your tool is reassembled. After making our final checks and any necessary adjustments, it’s cutting ability is tested. If we are happy with the result, your garden tool is returned to you ready to get to work. Garden tools typically take around 5 minutes each to sharpen (we’ve got it down to a fine art; everything in its place and a place for everything!). Chainsaws and hedge trimmer blades are around 20-30 minutes. How do I go about getting my garden tools sharpened? we can bring our mobile workshop to your home; there is a minimum order of £50.00 for this service. Most of our home visit customers like to spread the ‘sharpening-love’ and get together with their friends, family and neighbours to gather enough items between them. This is a great way to build community spirit and stay connected!